I love pretty things. Pretty music. Pretty fabrics. Pretty plates of food. So when scrambled eggs look more like a kitchen sponge than a delicious breakfast, I am not happy. One morning in NYC, I had cooked a plate full of aforementioned kitchen-sponge-eggs. I needed color. Red. Green. Who cares. I dug through my refrigerator (which I shared with about 28 people) and found a bag of spinach. Never underestimate the inspiration you can find in a crowded refrigerator. I melted a little butter in a pan, sauteed the spinach for 2 minutes (until slightly wilted) and broke 2 eggs directly on top. I added a little kosher salt and ground some pepper while whooshing around. In about 4 minutes I had a delicious breakfast. I served with sliced tomatoes to add a little red to the plate. 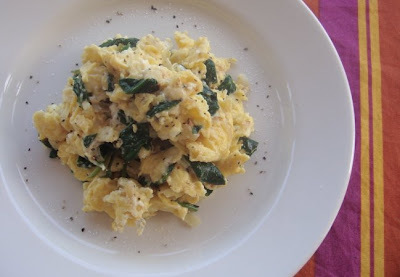 My new deluxe scrambled eggs were shared with one of my fellow 'refrigerator-sharers' (also one of my dearest friends.) I cook eggs, and she fills our life with incredible music. Check out the addicting music of Miss Kelley McRae by clicking here. (Kelley can also vouch for the eggs. She still likes them).